Fertile, MN (January 24, 2018) - The Days of 76 rodeo complex in downtown Deadwood, South Dakota, played host to Rounds 7-8 of the snocross National tour this past January 19-20. It was borderline t-shirt weather in the Black Hills, with warm temperatures and sun during daytime racing and mild evenings. 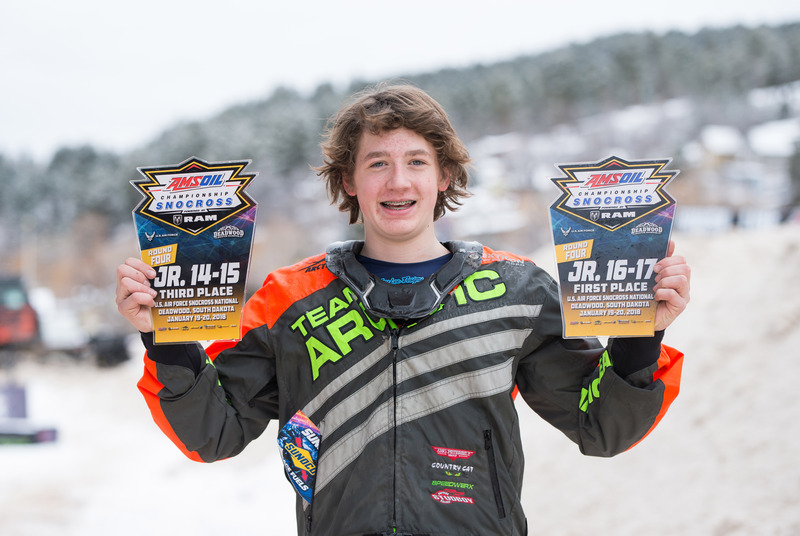 Christian Brothers Racing riders Logan Christian, Jacob Yurk and Anson Scheele brought the heat to their respective classes with all three riders finding steps on the podium. Christian (doc/AMG Peterbilt/Arctic Cat) entered Deadwood looking to get back on pace after racing with the stomach flu at Rounds 5-6. He wasted no time, cruising through heat racing on Friday and posting a 2nd place podium finish. 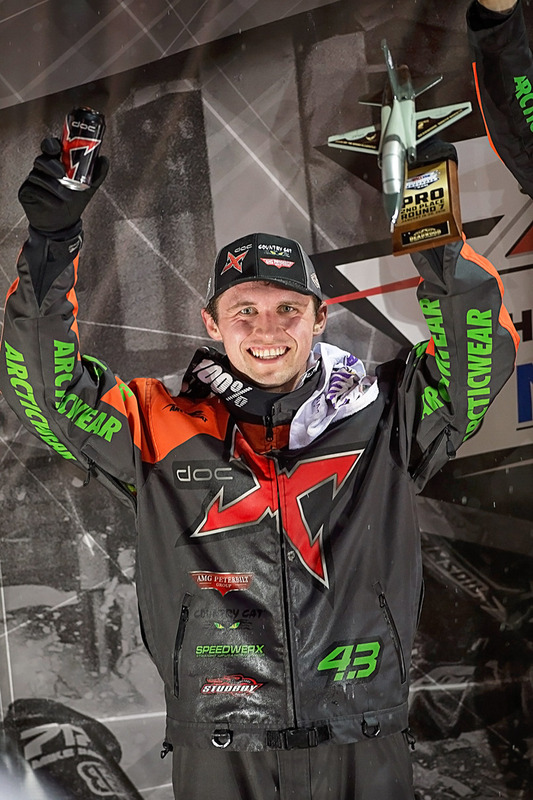 He came back Saturday nearly matching his heat performances and missing the last podium spot after an unfortunate off dropped him a spot to a 4th place finish. "My mechanics, Betsy Halvorson, D.J. 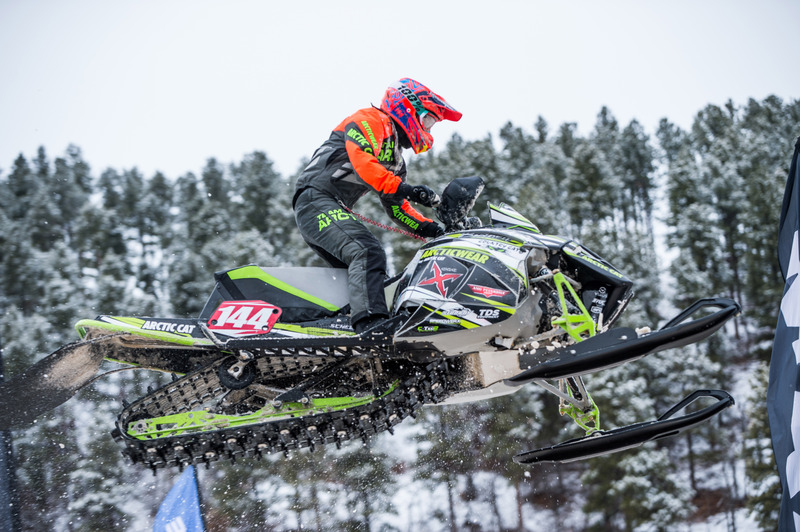 Ekre and Mike Carver really had my Arctic Cat ready to rock this weekend," Christian said. "We have some more ideas we want to test during the break before New York. The team put in an awesome effort this weekend and they are the ones making this season so successful. We are halfway through and feeling stronger and faster than any season I can remember." 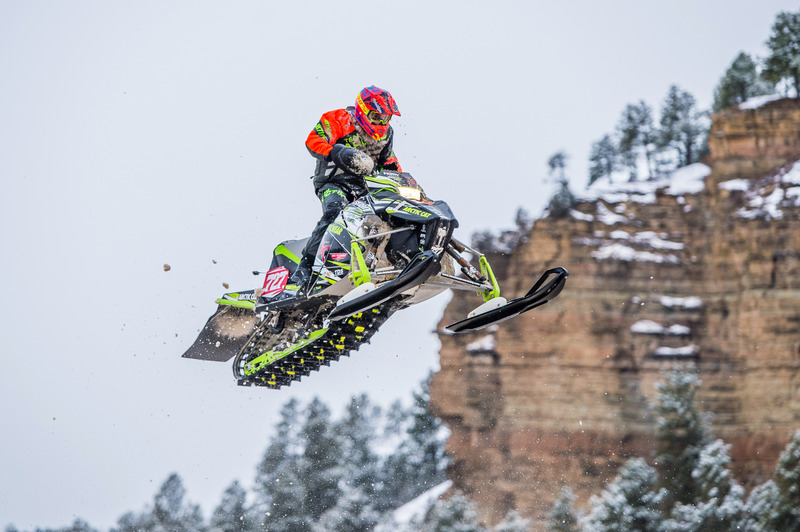 Yurk (Country Cat/TDS Equipment/Arctic Cat) entered Deadwood after posting the best weekend of his career in the Pro Lite class with a win and a 3rd place finish. Deadwood brought a bigger challenge to the racer and his crew, throwing all kinds of obstacles at them both on and off the track. "We've had a lot of success so far this season and Deadwood taught us the value of staying positive and keeping our heads down, working hard to solve problems," said Yurk. "No matter what happened we stayed positive and it paid off with a 3rd place finish on Saturday. For me, Deadwood is the most challenging circuit both physically and mentally, so I'm happy to be leaving healthy and with a podium." Scheele (Country Cat/Speedwerx/Arctic Cat) continues to set the pace in Jr. 16-17, taking the win on Friday. He came back Saturday to take 3rd place in Jr. 14-15. Christian Brothers Racing gave away their fourth Troy Lee Designs Helmet. 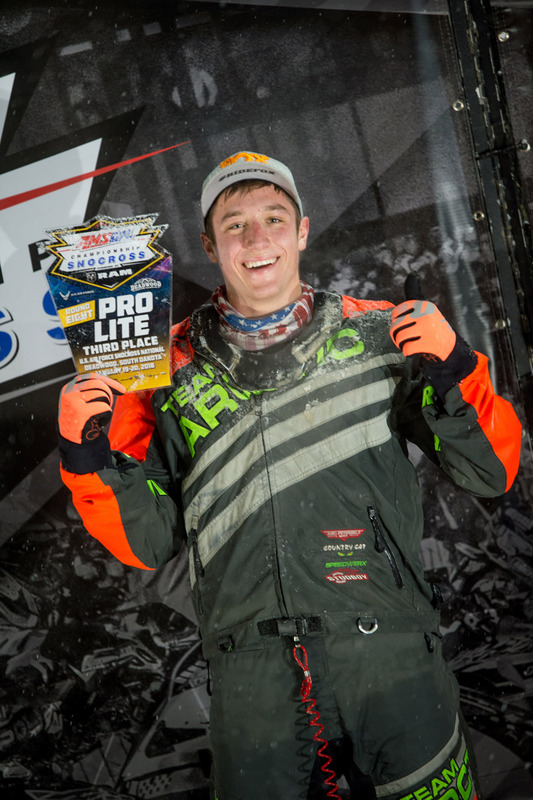 As the drawing winner, Lucas Terry took home a Troy Lee Designs SE 4 Youth Factory Helmet. 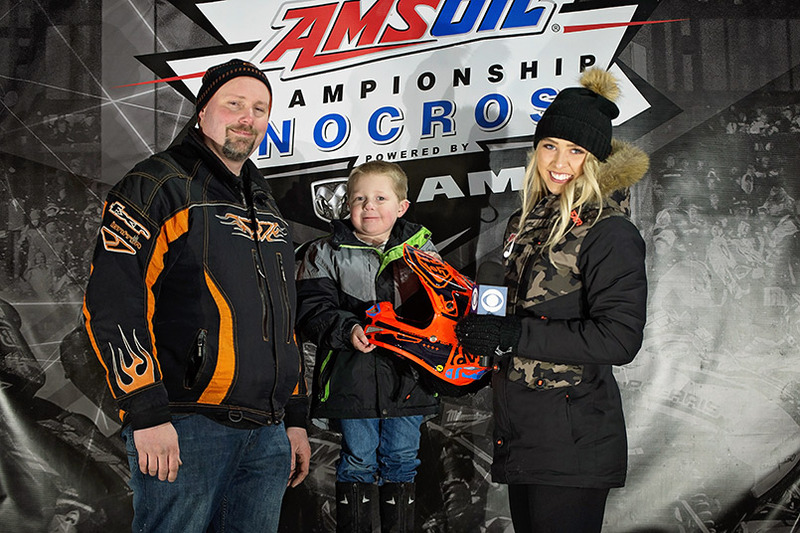 In addition to Troy Lee Helmets at every event, race fans also have the chance to enter to win an Arctic Cat ZR 200 snowmobile. The giveaway is open to fans 17 years old and younger and they must be signed up by a legal parent or guardian. Only one entry will be allowed for each eligible fan per event. The winner will be drawn Saturday, March 17, 2018 at the ACS Lake Geneva Grand Finale in Lake Geneva, Wisconsin and need not be present to win. 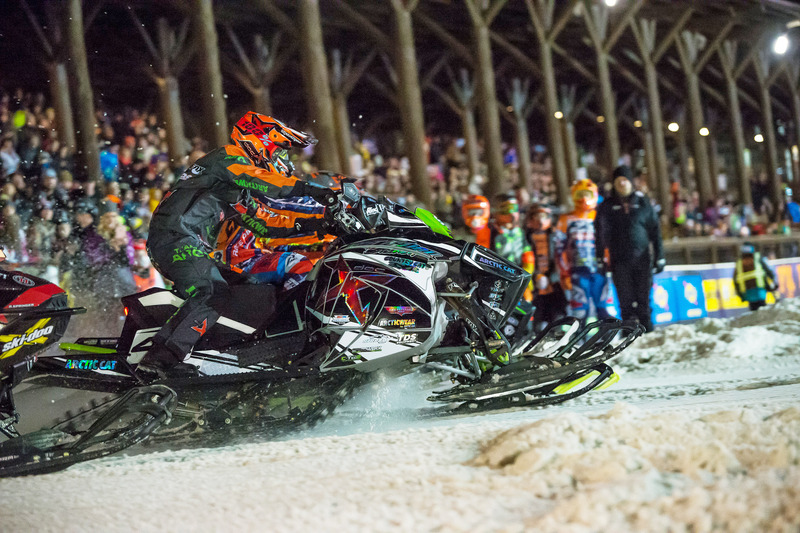 Next up for Christian Brothers Racing snocross riders is the U.S. Air Force Snocross National at Seneca Allegany Resort & Casino in Salamanca, New York, February 16-17. For more information on Christian Brothers Racing visit www.christianbrosracing.com. Follow Christian Brothers Racing on Facebook, Twitter, Instagram and YouTube.